The new SC3 machine is the most versatile CNC automated component saw available. The machine is capable of processing well over 3500 truss parts or 18,200 feet of I-Joists in a single shift, but gives a company the freedom to go way beyond the functionality and capabilities of its competitors component saws. Over 30 years of experience, customer feedback and quality have been built into the SC3. Fully equipped the machine can process: Truss, I-Joist, stair stringer and stick framing components and even allows a customer to process entry-level timber framing parts to broaden their income potential. Since the first presentation in 2003 the SC3 machine series has been consistently further developed by Hundegger. In 2015, Hundegger delivered already 800 machines of this type to customers around the globe. Constant innovation and improvements ensure that the SC3 will never become irrelevant in the building industry. Did you know that some of the largest truss and I-joist manufacturers in Canada uses up to 4 machines of this type almost exclusively for the production of their products? Timber cross sections from 20mm x 40mm to 160mm x 450mm (optionally 200mm x 450mm) can be processed regardless of finished part and rough lumber length. The SC3 machine also allows to process stacked lumber - so, two saw cuts can produce up to four parts in one pass. To do that, we use our in-house made part and job optimization software. The software is free of charge for all of our clients - even software updates for pre-owned machines are free of charge and all of the greater designer softwares companies will compare with our software. 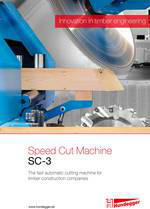 Maximum flexibility through modular system Whether small, medium or large scale companies - the SC3 Speed Cut machine series is the best choice due to the modular system. Modular means the machine can be adapted in various ways by any given times. Even the standard SC3 model can be ordered with pre-installed empty tool and aggregate spots which allows you to add additional aggregates years after the machine was build. This is a great advantage and your company can always keep-up with your competitor. And you don’t have to pay one extra dollar for software adaption in case you install more aggregates - our software is always free-of-charge for our clients. Did you know that our Canadian service location in Airdrie / Alberta exist since 2007 in order to support our constantly growing clients in Canada? Out-of Calgary, we offer a highly qualified pre-sale and after-sale service for the entire Hundegger production line and in order to do so, we keep a large stock of crucial spare parts and tools here in Airdrie. We also provide a telephone and email hot-line for our Canadian clients. Our well trained service technicians are Canadian Citizens / Permanent Residents of Canada and always on the go to assist when problems accrue - even and mostly on weekends. SC3 Brochure Please check the attached SC3 brochure to find more information about the whole system. You are also very welcome to contact us for more detailed information on our products. 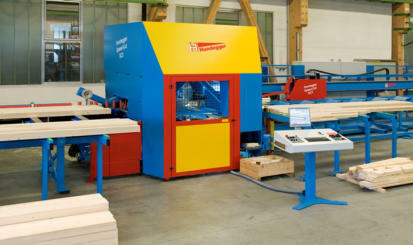 Hundegger SC3 machine series The new SC3 machine is the most versatile CNC automated component saw available. The machine is capable of processing well over 3500 truss parts or 18,200 feet of I-Joists in a single shift, but gives a company the freedom to go way beyond the functionality and capa bilities of its competitors component saws. Over 30 years of experience, customer feedback and quality have been built into the SC3. Fully equipped the machine can process: Truss, I-Joist, stair stringer and stick framing components and even allows a customer to process entry-level timber framing parts to broaden their income potential. Since the first presentation in 2003 the SC3 machine series has been consistently further developed by Hundegger. In 2015, Hundegger delivered already 800 machines of this type to customers around the globe. Constant innovation and improvements ensure that the SC3 will never become irrelevant in the building industry. Did you know that some of the largest truss and I-joist manufacturers in Canada uses up to 4 machines of this type almost exclusively for the production of their products? Timber cross sections from 20mm x 40mm to 160mm x 450mm (optionally 200mm x 450mm) can be processed regardless of finished part and rough lumber length. The SC3 machine also allows to process stacked lumber - so, two saw cuts can produce up to four parts in one pass. To do that, we use our in-house made part and job optimization software. The software is free of charge for all of our clients - even software updates for pre-owned machines are free of charge and all of the greater designer softwares companies will compare with our software. Maximum flexibility through modular system Whether small, medium or large scale companies - the SC3 Speed Cut machine series is the best choice due to the modular system. Modular means the machine can be adapted in various ways by any given times. Even the standard SC3 model can be ordered with pre-installed empty tool and aggregate spots which allows you to add additional aggregates years after the machine was build. This is a great advantage and your company can always keep-up with your competitor. And you don’t have to pay one extra dollar for software adaption in case you install more aggregates - our software is always free-of-charge for our clients. Did you know that our Canadian service location in Airdrie / Alberta exist since 2007 in order to support our constantly growing clients in Canada? Out-of Calgary, we offer a highly qualified pre-sale and after-sale service for the entire Hundegger production line and in order to do so, we keep a large stock of crucial spare parts and tools here in Airdrie. We also provide a telephone and email hot-line for our Canadian clients. Our well trained service technicians are Canadian Citizens / Permanent Residents of Canada and always on the go to assist when problems accrue - even and mostly on weekends. SC3 B rochure Please check the attached SC3 bro chure to find more information about the whole system. You are also very welcome to contact us for more detailed information on our products.